Excerpts from Hounds and Hunting through the Ages by Joseph B. Thomas, MFH (©1928, Windward House, Inc.), the first comprehensive book on hunting and hounds ever written in America. Joseph B. Thomas was MFH for the Piedmont Hounds in Virginia 1915-1919. He came to the Middleburg area from the east coast, establishing Huntland, his historic estate comprised of house, kennels, and stables. He became the largest breeder of foxhounds for mounted hunting in North America, owning as many as 1,000 hounds at one time. He helped define the American foxhound breed. This is a series of some fascinating excerpts which provide insight into the heritage of our sport today as told by Linda B. In rough America, a….difficult task for the huntsman is to hunt hounds wide enough to find a fox, that may be anywhere, and then get his pack together, and keep it together when a fox is found. Even with perfect hounds, his task is great. To make matters worse, it is extraordinary how little appreciation he will receive from the layman, who often seems quite happy so long as he can gallop after something, right or wrong, with rarely any sympathy for the huntsman who may have unsuccessfully worked himself blind to give sport under impossible conditions. 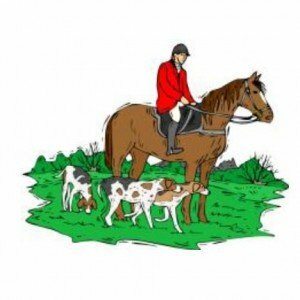 The orthodox forms and circumstances attending the hunting of a pack of hounds in any open country with small, clean-edged coverts are quite simple and exact. Such conditions, of course, exist in most English hunt countries, and a wonderful description of the procedure is given in Masefield’s “Reynard the Fox.”Imagine a beautiful, trim, open country across which one can see for miles; oceans of grass, clean-cut hedges, gates in and out of almost every field, occasional rail fences, and small water courses; every few miles, thick coverts of thorny gorse bushes or trees. The meet is at some famous country house, or in some delightful village. The well-bred and conditioned…pack stands placidly with well-mounted huntsman and watchful whippers-in, awaiting the master’s signal to proceed to the draw. Once this signal is given, hounds move off across a few fields, and through several gateways to the edge of a well-known covert, where a fox is almost certain to be found above ground…The pack, under perfect control, approaches the edge of the small covert…and at the huntsman’s cheer silently dash to where their fox should be waiting for them…This is very simple,–hounds are led to their fox; he is generally viewed away; and the waiting crowd of horsemen and women dash forward across beautiful, open grass land like the “Charge of the Light Brigade.” All this occurs in a very orderly manner; but this is the ideal hunting ground,–England! …to more clearly inform the layman about the wonders of British countries from a hunting point of view, it may be well to further state that the average hunt country suggests the well-kept appearance of a golf course; all winter the grass stays green; there are practically no rough spots, few holes, and in most countries rarely does one see a rock; a large percentage of the hedges and stone walls are well kept, and, after November, ditches are comparatively free from blindness [leaves are down, allowing the horse and rider to see to the other side]; there are few post-and-rail fences, no worm or snake fences, and, from observation of scores of countries in Britain, the author has never seen a plank fence. Miracle of miracles! 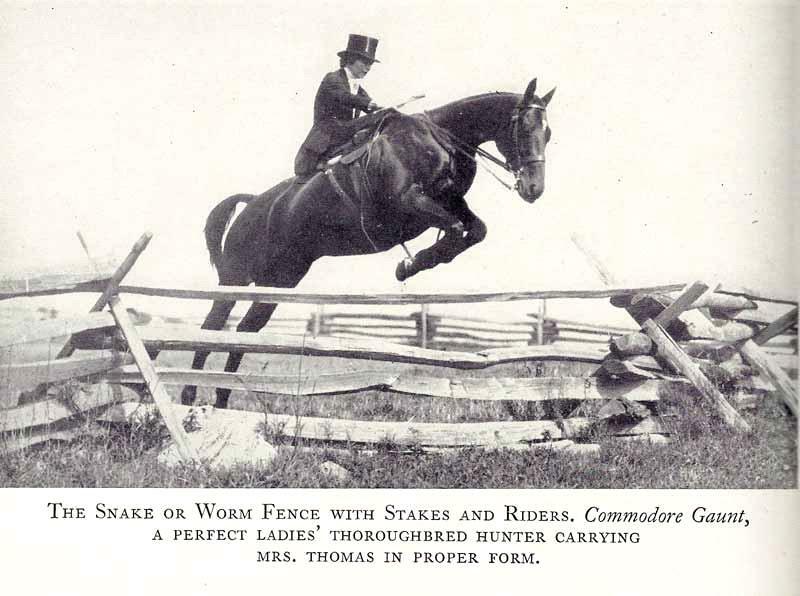 Almost every gate can be opened from a horse’s back, and closes and latches of its own weight, while there is hardly a gate in any American country I have ever seen that can be opened or shut without super-efforts, and to even move them one must frequently dismount. …What a different proposition confronts the American huntsman. He is terribly handicapped by a climate most unfriendly to the chase as practiced in Britain. It must be remembered that there is a vast difference, due to heavily wooded, rough terrain, climate, and scenting conditions between hunting…a fox in the…Shires of England and doing the same thing in the uncouth, wire-cursed topography of America, where…deer and hare are often more easily found than fox. Practically all procedure must be somewhat different, and, while many expressions and practices have been brought over to America from the mother country, the interpretation must be quite dissimilar. …in America…In the early autumn it often does not rain for weeks. [Note: moisture is required for good scenting. Little scent is held by dry ground.] I remember one such season, when it hardly rained a drop for five weeks. A like condition in England would be considered insupportable. By December, frost and snow are to be expected in all hunt countries north of the Carolinas; and for those countries north of Long Island, the season is usually finished by Christmas. In the best of countries, it is all very rough, and there are hardly any clean-cut coverts…After a rainy or snowy night, it is nearly impossible to find a fox above ground (a fact which most laymen do not appreciate); they have all gone in early to avoid the elements…This typically American habit of foxes, added to the usual bad visibility and bad scenting, makes conditions far different from England. 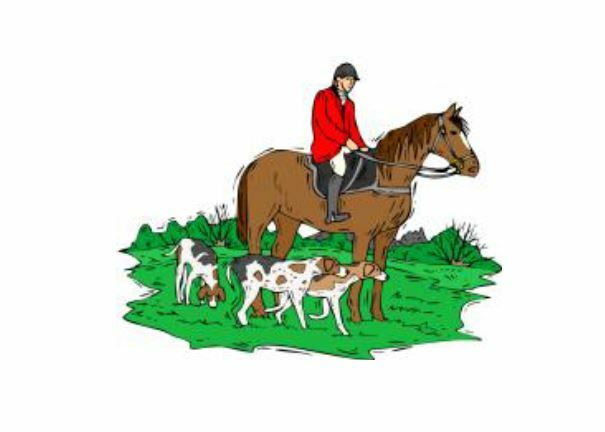 Under these circumstances, to have good hunts…hounds must have the very best working qualities…and a huntsman must have patience and flexibility of brain to figure out the varying conditions which present themselves every time he takes hounds out. My Virginia hounds can be taken to the edge of a covert as the most biddable English hounds are, but the covert may contain two hundred acres, instead of twenty, as in England, and rarely can a whipper-in be placed in any spot where he can be certain of viewing a fox away. We conclude this installment in this series with thanks to our Rocky Fork huntsmen and whippers-in for their heroic efforts to show us good sport and manage the hounds, and still come home sane and in good spirits!….LB.